A number of my friends pulled some surprised faces when I told them I was going to the Gambia for a traditional African experience. They wondered why I didn’t choose the more well-known Kruger Park or Serengeti National Park, now a ‘wonder of the world’. Well, since I travel so much, I had already experienced the traditional safari but wanted something a little different and I didn’t want to blow all my cash on an experience that I could get at a fraction of the cost somewhere else. 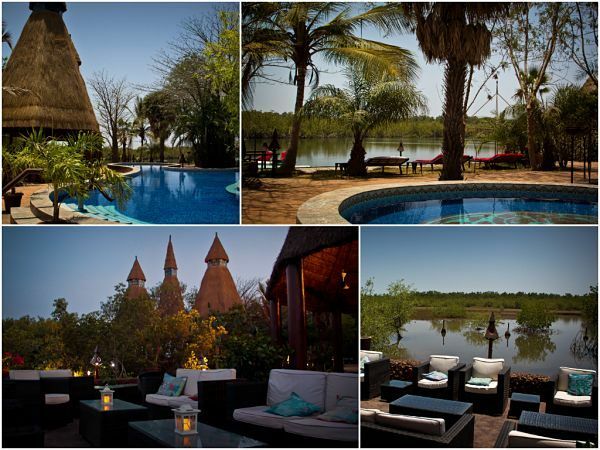 So I looked for cheap Banjul flights and booked my holiday experience with Mandina Lodges for a majestic experience along the Gambia River. The forest tour is rich in mysticism and exciting history, as the guide explained the meaning behind the ‘sacred forest’ while we headed up river into the heart of the forest. There is so much birdlife (I wish I knew more about the birds I saw, but unlike many in the boat, I am not an ornithologist). I enjoyed watching the baboons more. Once we shimmied the boat on shore, some of the group met with a witchdoctor, an African mystic, who read palms while puffing from his thin pipe while under the watchful eyes of others from the nearby village. We then watched an agile man work his way up a palm tree with rope and gave the brave in our group a chance to try it. They make it look so easy… believe me, it isn’t. My arms were hurting a little afterwards but the alcoholic drink made from palm sugar made me feel far more relaxed. The food, music and wonderful traditional dancers lifted the experience in the forest to beyond my expectations. This private five-star luxury lodge definitely lived up to what I was expecting. Everything was super clean, fresh and absolutely beautiful. I stayed in the floating river lodge with a balcony that encircled the lodge. Mandina Lodges uses solar power, so I only used the plugs for my iPad, phone and fans. The forest tour takes about a day and I spent the remaining days relaxing and occasionally walking through the forest and interacting with some of the animals and reptiles that have made the region their home. It was very low-key, rejuvenating and absolute bliss. 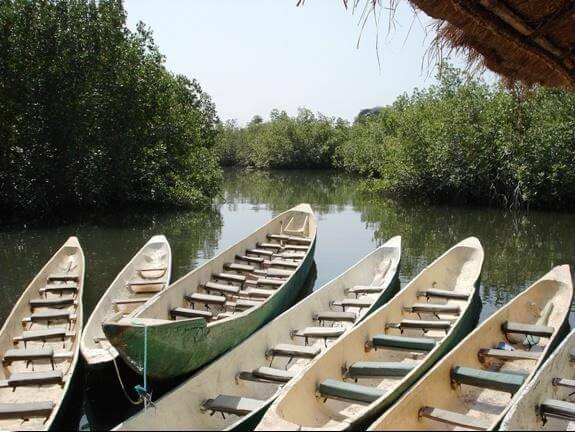 I checked out Thomas Cook (http://book.flythomascook.com/cheap-flights/to-Banjul-Gambia) for flights out to Banjul (and return TC flights because I trust them). You don’t want to skimp on the plane ticket, trust me I have used some dodgy airlines just for the sake of saving a few bucks and it looked like the planes were held together with duct tape…so always use a reputable airline or travel agent. The lodge has a minibus to transport from Brikama, so all I had to do was get to Brikama and they took care of the rest. West Africa is a Malaria region, so make sure to get your shots before you head out. The lodge has mosquito netting but when you’re on your expeditions, always wear insect repellent, I use Tabard (works like a bug charm). Last updated by Scotty Montrose on 10 April, 2014 in Destinations.